Almost a month has passed since the Gavi incident and the elephant has suddenly become my current fixation. 25th February was an important day in the Palakkadan calender. It was Manapully Vela, the annual event that falls in late February or early March. The Malayali has an elephantine fixation. Every temple festival is inevitably linked to a parade of decked up elephants, and all of them tuskers of various sizes and hues. 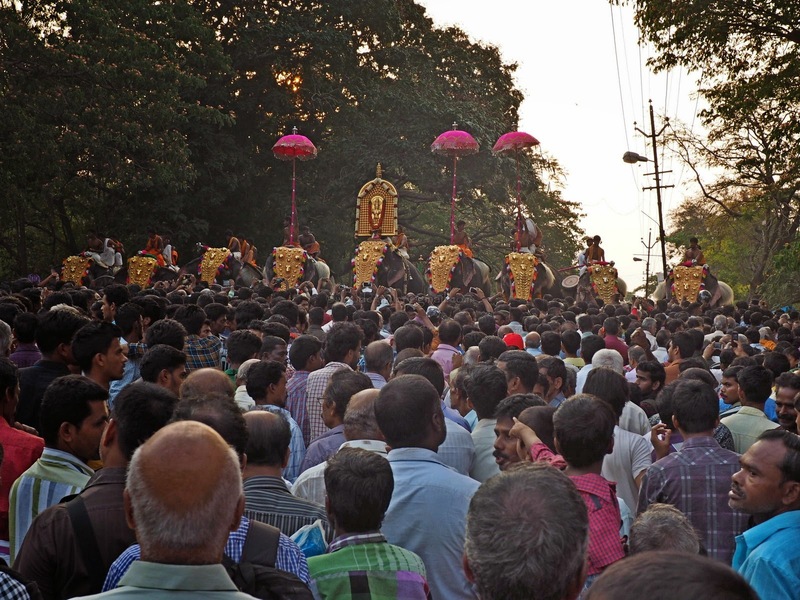 The most famous is undoubtedly the Thrissur Pooram, so famous it has a website of its own! 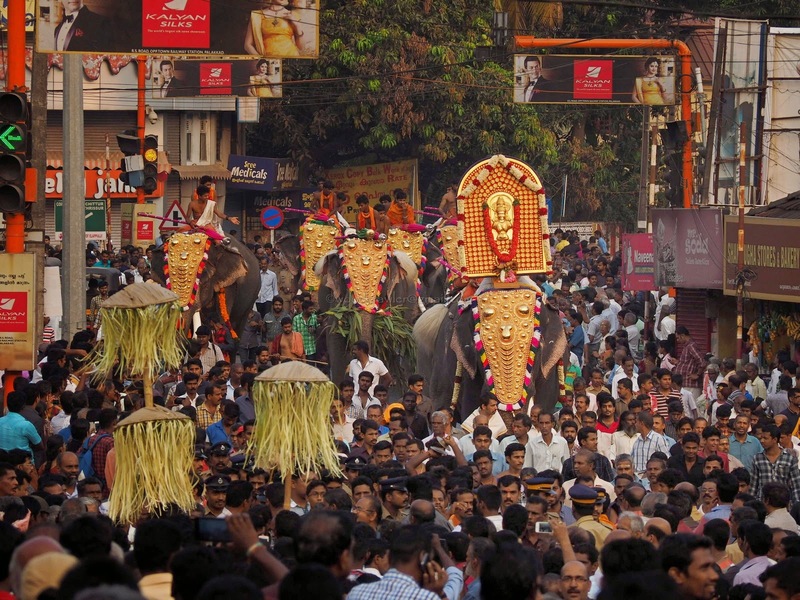 Central Kerala has a tradition of temple festivals that culminate with a display of these decked up tuskers. Even small roadside shrines have nowadays started ostentatiously imitating the big temples. They use is this as an excuse to collect donations for the upkeep and development of the temple but in realty, is shared by the members committees that plan and execute such events. 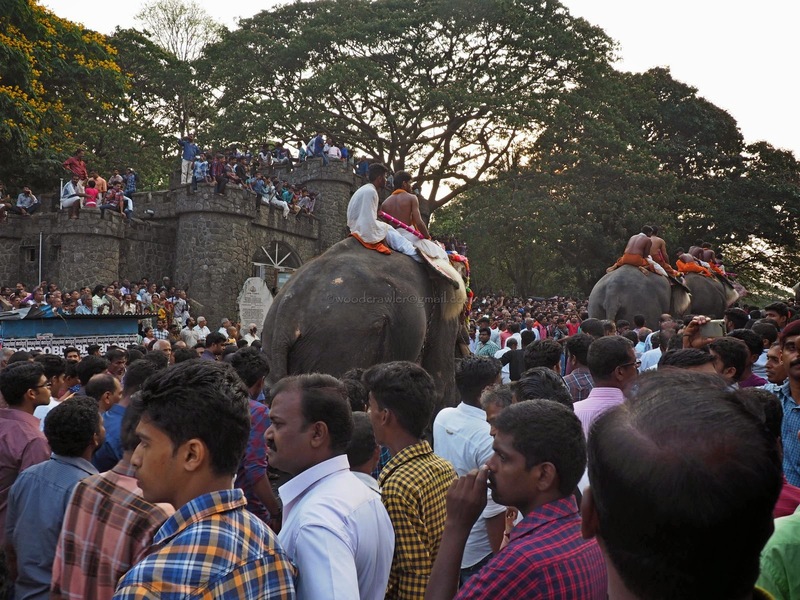 Palakkad has a few such events that involve a large assemblage of tuskers; Nemmara-Vallangi vela in Nemmara, Chinakathoor Pooram near Ottapalam and the Manapully Vela in Palakkad town. All of them involve participation of, on an average, 30 tuskers. A large assembly of tuskers is a sure recipe for trouble. With smaller temples also vying for a share of the 'grandeur' of an elephant parade the domestic elephants in Kerala are a harried lot. Once the season sets in, typically at the beginning of summer, they are always on the road being take from temple to temple. Hiring out elephants is good money so the owners try to squeeze in the maximum number of rental in every season. 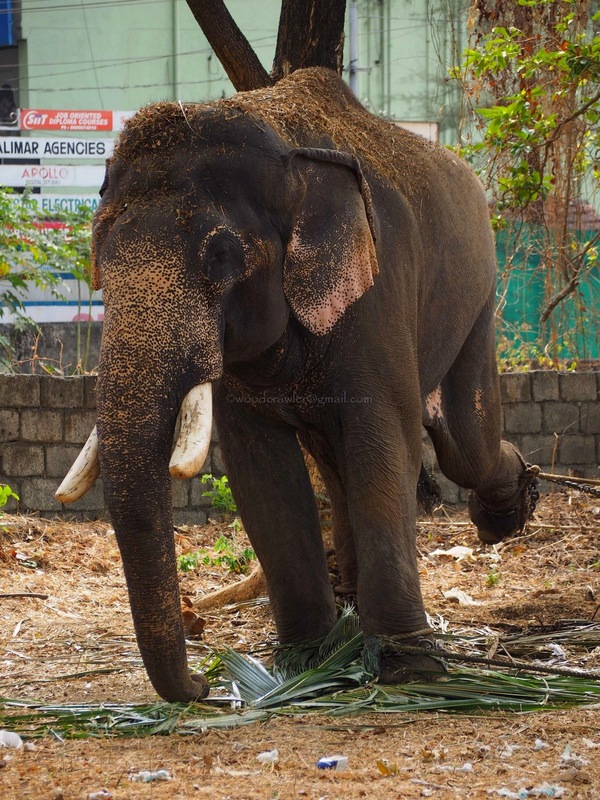 Just a day before the Manapully vela this elephant, Guruvayur Sankaranarayanan, decided to throw a tantrum on the way to Palakkad from another Vela where he was paraded. 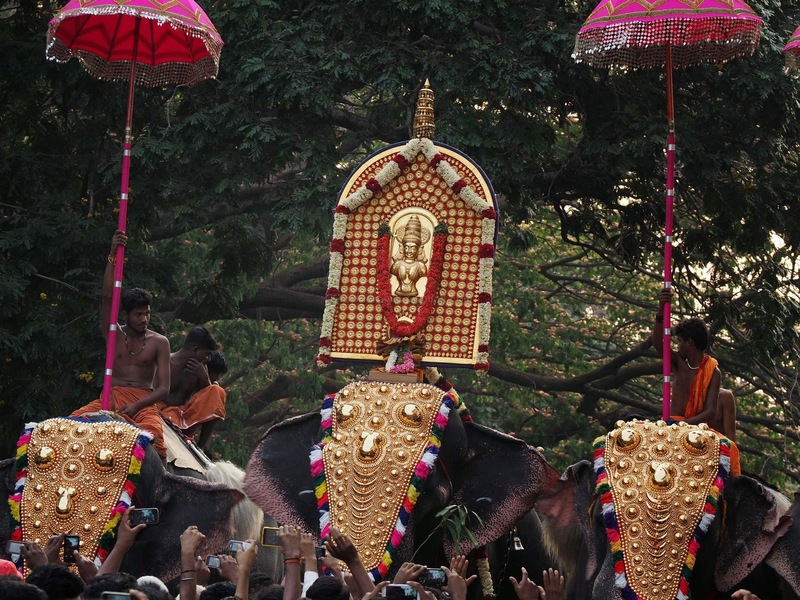 Eventually, he was not used for the procession and was sent back to Guruvayur. Guruvayur Sankaranarayanan tethered to a tree for misbehaving! A few years ago the normal number for Manapully Vela was 30 elephants. 15 of the Manapully kavu and 5 each from the other temples. The elephants literally wade through a sea of humanity towards the entrance to the fort where they are lined up. At the top of the slope they line up facing downwards, towards the east. This time, instead of the usual 15, Manapully Kavu fielded only 9 elephants. Perhaps the fear of another going berserk influenced the decision or the cost of hiring so many elephants. Whatever it was the Vela seemed to have lost its sheen this time. What was instantly obvious was the the reduction in the number of elephants had given the beasts a lot of gap between themselves. I am happy it happened that way. I always used to wonder how they managed to squeeze fifteen very large tuskers in a 30 meters wide gap between the entrance to the fort and the Kota maidanam. Even if one of the elephants decided to get angry it would also effect the others. There is nowhere to go but forward and the panchavadyam artistes and the crowd form a human wall some 50 layers thick towards the bottom of the slope. If there is an unfortunate incident where any of the elephants were to run amok it would be a disaster. The crowd would panic and try to run to safety. Children and old people would become victims of the stampede and a few would fall prey to the elephant's temper. In such a situation the blame has to be placed on the greedy owners and the heartless mahouts. Maintaining an elephant is an expensive proposition. 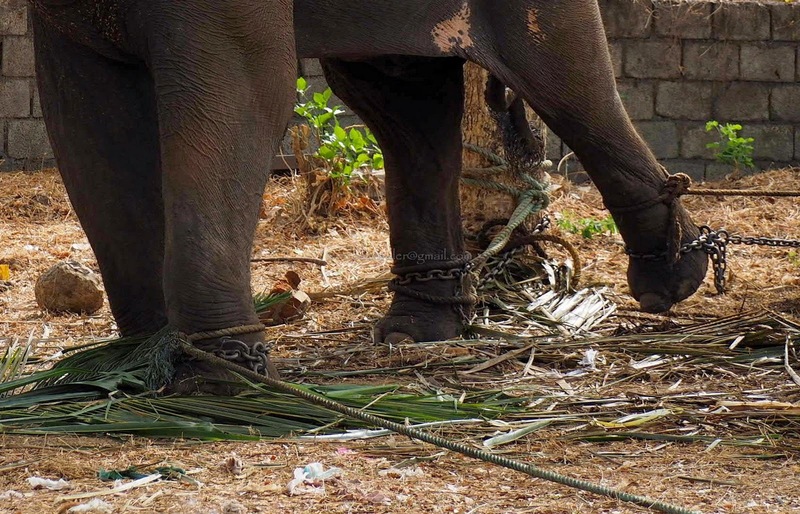 On an average Rs.3000 to 3500 is required for the daily upkeep of the elephants and its mahouts. 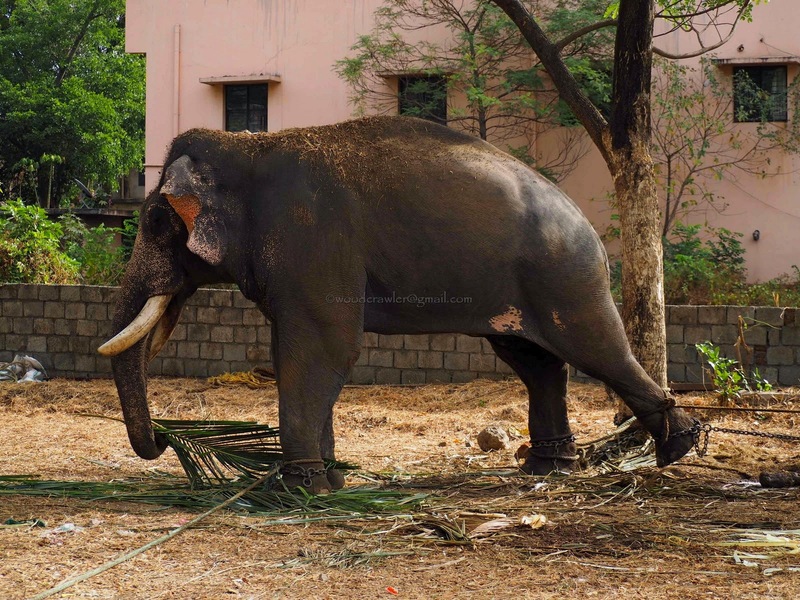 It roughly translates into an annual expense of Rs.12,50,000/- for an elephant. This has to be recovered in the three months between mid January and mid April. Cost of hiring an elephant ranges from Rs. 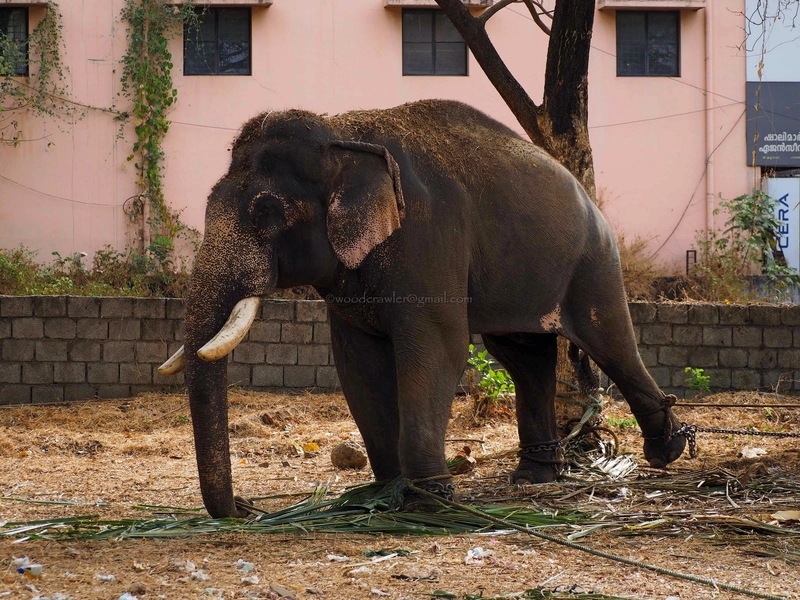 50,000 to Rs 4 lakhs daily, depending on the status of the elephant! 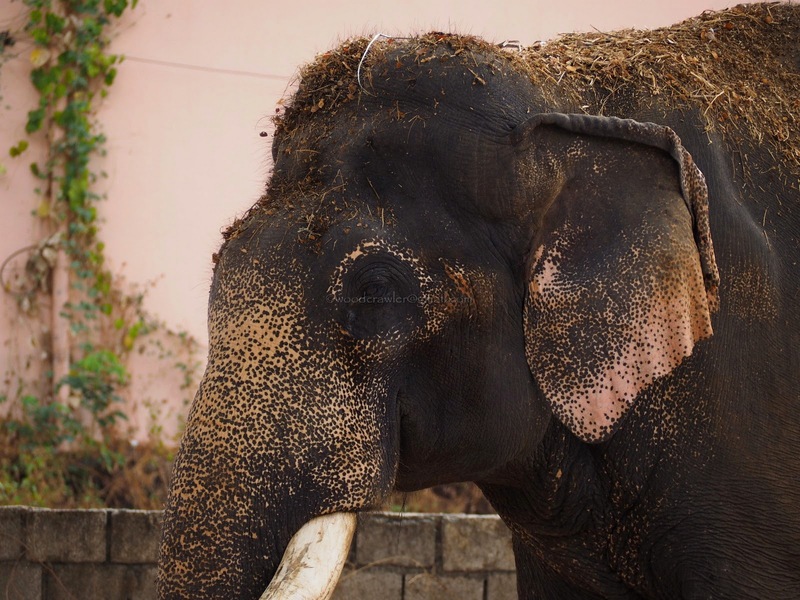 There is an excellent article on the state of the temple elephants of Kerala here. Elephants are wild animals. We tend to forget that they are used to freedom in the forests they are born in. The spend almost two-thirds of a day wandering around feeding on things they fancy. An animal of this size has to migrate from one feeding ground to another. Typically they are always on the move especially in the summer, congregating around areas with water. season is at its peak, they are driven nonstop from one venue to the other without rest. They are denied food and water and the drunken mahouts take out their frustrations on the poor beasts. During such festivals they are paraded through the street in the heat of the daytime, because the pomp and glory of the festival will be lost in the nights! 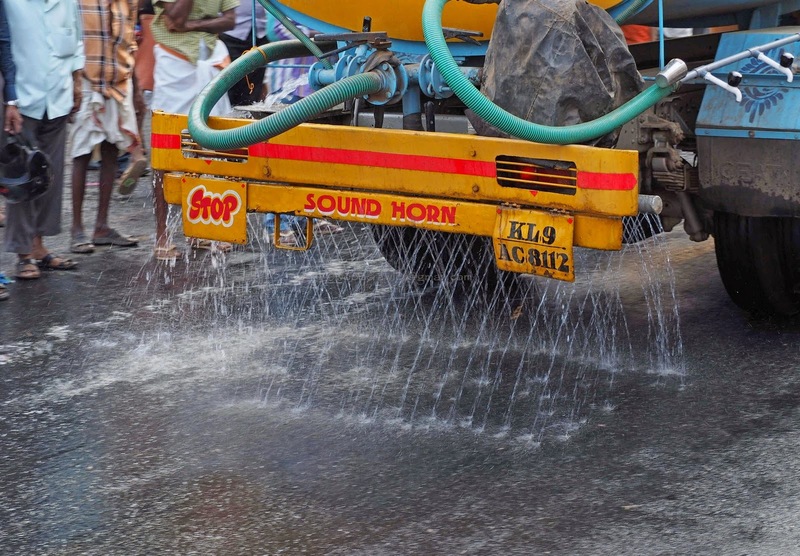 Now stricter authorities have shifted the time to the evenings and as a preparation the roads are doused with water to cool the hot asphalt before the elephants reach the place. What most people tend to forget is that there is no such thing as domestic elephant. All elephants are wild but we keep them captive for our own selfish interests. If someone objects, the blame is conveniently placed on the deity of the temple! The fact is, no God will want to torture a gentle creature like an elephant. Therefore will not be surprising if a misbehaving elephant is God's way of telling us, "Enough is enough!" Guruvayur Sankaranarayanan went back to Punathoor Kota in a truck. Whether his life will change is debatable. This time he was only behaving like a stubborn child but the next time he may not be so forgiving. The sooner we realize that the elephant belongs to the forest the better, for both us and these gentle creatures. I'm praying that the number of elephants paraded next year should be five! This is the final part of the series 'The Aftermath of an Elephant Attack', a three part series on how we should behave in wilderness areas. The third part has a direct connection with this. In case you missed it go back and read that post on how the elephant will behave in the presence of humans. The LINK is the sentence in PINK, as always! I agree with your views RPR. Always was uncomfortable seeing the way these gentle giants are handled for our own selfish needs. I hope these age old traditions make way for more humane rituals. Great blog! I believe your blog found a space in wild life and nature conservation trust!! That is great!! !